Q: Hahaha! You're cute! 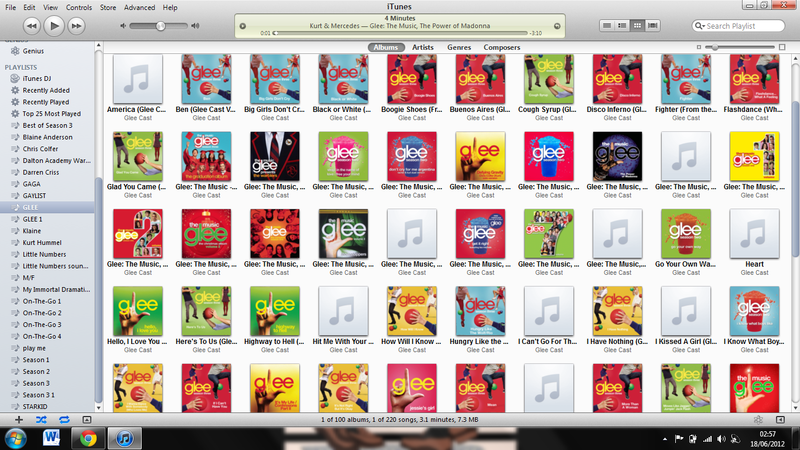 :) Are we gonna get any more Rachel/Blaine duets?? A: I would bet on it! Q: Someday, you can choose any song of Fall Out Boy or Coldplay to song in Glee, it is possible? A: Coldplay!! I pray for that every evening. Q: since the whole cast loves Adele, what do you think about covering some of her stuff? A: great idea! I love her too... stay tuned/. Q: Will Kurt be leaving the Warblers soon? A: I hope so!! ND needs him! Q: There seems to be more Top 40 fare this season compared to last. Would you agree, and any particular reasons for the changes? A: it will fluctuate back and forth. Q: If there were gonna be a blink-182 song on glee, would you consider doing All the Small Things or even Adam's Song?! Q: will Harry Shum get solo (talking is counted) or duet in season2? Q: Can we expect to see Jonathan Groff back this season anytime soon? He has such an amazing singing voice. A: I hope so!! I LOVE him. Q: any posibility of Glee record a song in Portuguese or Spanish?? Brazil loves Glee!!! Q: Ryan Murphy mentioned @DarrenCriss would be singing Misery. Is that still happening? Q: Cory has said he really wants to sing "I Want To Know What Love is". Any chance Finn could sing it to Rachel when they reunite? A: great song for him! Q: Is it true Lea will be singing Pink's f--n perfect? A: possible yes. Confirmed no! Q: If you could pick one song to describe how Finn feels for Rachel, what would it be? Q: Any plans for Lea to sing one of the amazing songs from Spring Awakening? A: I like that! Not planned... but a great idea. Q: What has been the most difficult song to re-create? Why? A: tough one... Thriller. Cuz I was afraid if I messed this up my head would roll! Q: is there a song that you would want to hear covered on the show? if so, who would cover it? A: new directions singing AFRICA by Toto. Q: Tina's only solo was 25 episodes ago! In which episode is she getting one again? She deserves a showstopping number! A: In my opinion she had the best song of the season. DOG DAYS ARE OVER!! I knew she would kill that! Q: will Tina get any solos any time soon? Q: More Darren/Chris duets soon? Baby It's Cold Outside feels like it was decades ago. A: it was wasn't it? I'll work on that. Sounds like a great idea! Q: Can we except more karaoke tracks on iTunes in the future like you did some last year? Q: I want Finchel to sing any song from Backstreet Boys please! Q: maroon 5, beatles, white plain t's, hey monday, panic! at the disco on GLEE, PLEASE!!!!!!!!!!!! A: Gwyneth Paltrow and friends!! It's AMAZING! Q: favorite song of all time?? A: Nothing together planned... Rachel has some awesome songs coming!! And thanks!! Q: Are there any Dianna's songs? If so with who? A: Dianna lost her voice for a little while.. we are nursing her back then she will be rockin it again! Q: Will we be getting to hear Lea and Mark sing more together? Their duet was absolute perfection! A: nothing planned... but you never know! Need You Now was special!